Plastic – as a fully synthetic, commercially successful substance – was invented by Leo Baekeland in 1907. In just 111 years plastic has not only been used in a multitude of products worldwide, it has also become an increasingly unavoidable environmental issue. 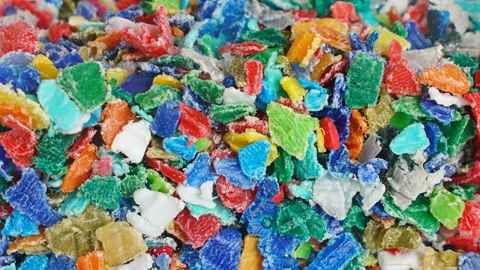 Microplastics are tiny pieces of plastic fragments less than five millimetres in length. They include plastic film, beads and thread from cosmetics, textiles, industrial processes and the degradation of larger plastic products. Despite efforts to recycle plastic, its durable nature and slow degradation has led to mountains of waste, and the presence of microplastics in our food chain. These tiny fragments enter the food chain via freshwater and marine ecosystems quite easily, because you cannot always see them and they are the right size for organisms to eat. In October, a national team of 18 scientists was awarded an MBIE Endeavour Fund grant of $12.5 million to conduct a five-year research project exploring the impacts of microplastics on New Zealand. Under the auspices of the Institute of Environmental Science and Research (ESR), the team is led by Dr Olga Pantos (ESR) and Dr Grant Northcott (Northcott Research Consultants) and includes top researchers from Scion, the Cawthron Institute, the University of Canterbury and the University of Auckland. Each team member is responsible for different steps in the project, but together they will apply their expertise to determine if microplastic contamination poses a risk to New Zealand’s unique ecosystems. The project includes a social science and Vision Mātauranga component and is guided by an advisory panel of experts. It will run until October 2023. Associate Professor Kevin Simon says that microplastic is a popular issue with the public and the number of studies addressing plastic is growing exponentially, as researchers focus more on plastic pollution. Associate Professor Giovanni Coco agrees that wherever you go, people want to know how much microplastic is being accumulated – and where. Along with colleague Dr Melissa Bowen, they will be focusing their components of the project in Auckland, primarily because of the strong link between the city and marine environment, and the hundreds of streams within Tāmaki Makaurau that flow into estuaries and on to the ocean. “There is a very big knowledge gap in documenting what plastic is in our freshwater and marine ecosystems in Auckland,” Melissa says. Plastic is a wonder substance, really, it’s hygienic and it’s waterproof. There are a lot of advantages to using it, you just have to figure out how to use it wisely. Melissa and Giovanni will concentrate on the accumulation and distribution of microplastics in the Waitemata Harbour. They are building hydrodynamic models – mathematical models based on measuring real water flow – to figure out where the microplastic is coming from, how the water is moving microplastics around and where they are going. Melissa will be doing all the measurements and will ‘ground-truth’ the model. Then Giovanni will develop the set of equations that will create the model and describe how water moves. The modelling component of the work will be supported by a PhD student before it is tested and validated. Another PhD student will work on a different component looking at more of the ecological effects of plastic and the ecotoxicological implications for freshwater biota, as well as food webs and what kinds of microplastic organisms are ingesting. 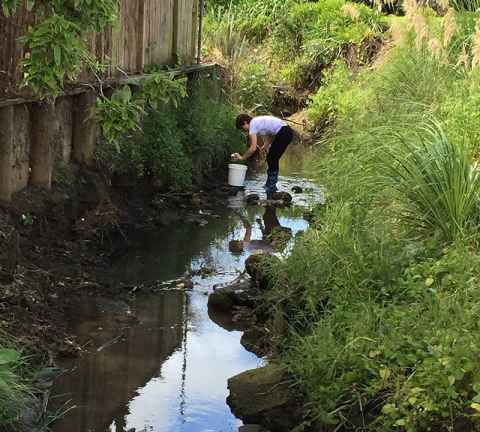 Work will start in simple laboratory systems at Cawthron and the University of Auckland, then shift to the Auckland Ardmore Field Station where they can create artificial ponds to replicate different treatments and environmental conditions. Tests will expose individual species to different plastics – with and without other contaminants. “Eventually we want to scale it up to more complex systems in which we will have not just single species but everything from algae up to fish – entire mini-ecosystems – so we can run more intricate experiments,” Kevin explains. Other components of the Endeavour project involving faculty researchers include: investigating microplastic-associated microbes and their role in biodegradation (Dr Gavin Lear); whether the plastisphere poses a biosecurity threat (Dr Xavier Pochon and Dr Anastasija Zaiko); and assessing the toxicology responses of organisms exposed to microplastics and their associated contaminants (Dr Louis Tremblay). 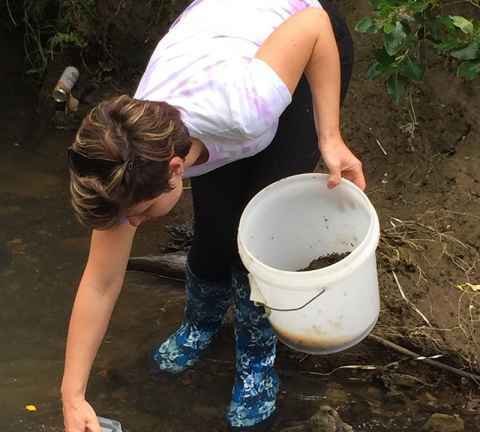 PhD candidate Nadia Dikareva (Environment) is sampling plastics in freshwater and estuaries and looking at the spatial distribution of plastic, as well as the historical accumulation of plastic across different time scales. Her current work will inform and provide some of the groundwork for the Endeavour Fund project. Melissa and Giovanni are anticipating a number of challenges as they work out how to create a realistic model that simulates the flow of microplastic through an estuarine environment. One of Kevin’s initial challenges is simply where to start, because the research is still new and there are a lot of variables to deal with, like finding out which plastics are causing the biggest problems. “There are all sorts of different plastics, different sizes and chemical formulations, new versus weathered plastic, lots of different contaminants that can be absorbed onto them and certain types of plastics may release chemicals in certain conditions,” he says. An overarching challenge facing all researchers is the speed with which this field of research is rapidly changing and advancing. “A big chunk of what we are doing is trying to come up with standardised methods, so that what we do across all the lab groups in this project is consistent, but is also internationally compatible and up to date with emerging technologies,” Kevin explains. Giovanni adds, “There are many interesting projects going on in many countries. For example, researchers at the University of Sydney are looking at video imaging and detection technology that will distinguish between sand and microplastics in the water. The issue of plastic and microplastic, and what to do about both, is extremely complex. “At the moment we cannot answer the questions that people are asking us,” Kevin says. “We are in the difficult position of supposedly being ‘the authority’, but we haven’t done the work, so we can’t provide the answers. The trio envisage that when their components of the project are complete they will have contributed to the methodology to model microplastic accumulation and dispersion patterns in our environment and support local authorities to regularly monitor microplastics in their waterways. “Getting rid of shopping bags is great,” Kevin adds, “But maybe we’ll find out we are focusing on the wrong plastic and some other type of plastic is more of an issue. “That’s part of what we want to find out: which microplastics are causing the problem. Because we are not just going to stop using every type of plastic right away. It is going to take time. There are other research projects focused on microplastics taking place within the Faculty of Science. In 2017, the George Mason Centre for the Natural Environment awarded funding to ‘Plastic pollutions and solutions’ – a project studying the impact of microplastics and associated chemicals that leach from plastics products – involving Associate Professor Kevin Simon, Dr Gavin Lear and PhD candidate Nadia Dikareva. More recently, Dr Julie Hope from the Institute of Marine Science was awarded a 2018 Marsden Fund grant for ‘The sticky link between microalgae, biofilms & microplastics: An interdisciplinary approach to understand the resuspension and transport of microplastics’.